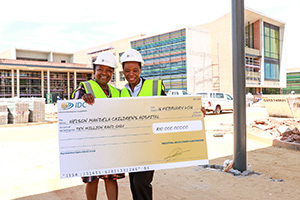 The IDC has donated R10m towards the building of the Nelson Mandela Children’s Hospital. 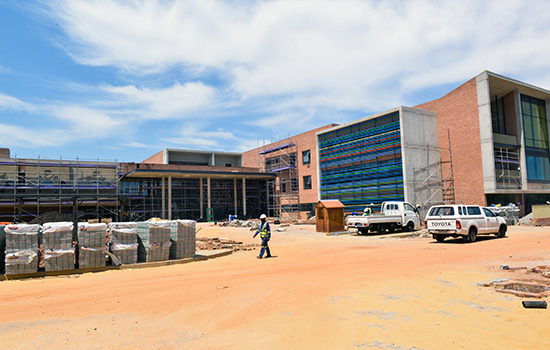 Construction of the Nelson Mandela Children’s Hospital located in Parktown, Johannesburg began in April 2014. The state-of-the-art hospital will have a specialised paediatric facility that will provide children from the southern African region with quality and affordable healthcare services. Handing over the donation on behalf of the IDC CEO, Geoffrey Qhena, IDC’s Divisional Executive for Corporate Affairs, Zama Luthuli said the development funder‘s association with the hospital was in line with the corporation’s CSI objectives. “This donation is part of the IDC’s contribution towards realising Tata Mandela’s legacy to build a hospital whose focus is solely on providing quality and affordable healthcare services. This facility when completed will be a living symbol that will go a long way towards celebrating Tata Mandela’s values particularly his passion, care and love for children,” said Luthuli. Receiving the donation on behalf of the Nelson Mandela Children’s Hospital Trust (NMCHT) CEO, Sibongile Mkhabela thanked the IDC for its financial contribution saying the development funder had now joined a growing number of both local and international donors that have committed to raising R1bn required to complete the project. The hospital is the biggest of its kind, to be built solely on the generosity of global citizens including ordinary South Africans, civil society and philanthropists drawn from cross sections of the world. The NMCHT which has been spearheading fundraising initiatives towards the project has since raised R790m which is R210m short of the R1bn target. “As we look towards completion, we thank the IDC for partnering with us in getting us closer to finishing this building,” added Mkhabela. Barring any major challenges, the hospital is expected to open its doors to the public in December 2016.